Successfully Added Q3H Waterproof 4K Sports Camera - SONY CMOS, 16MP, 4X Digital Zoom, 2 Inch LCS Screen, 170 Degree Wide Angle Lens (Silver) to your Shopping Cart. 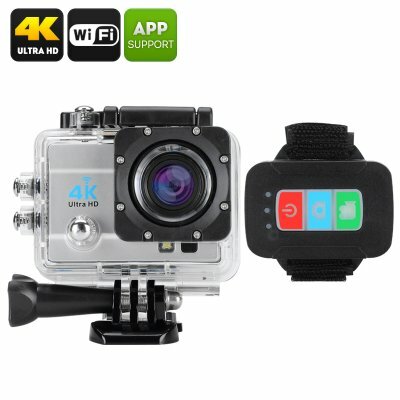 The TheQ3H waterproof sports action camera lets you record stunning 4K (3264X1836) footage, snap photos at 16MP, take it down to 30 metres underwater and connect to Wi-Fi for instant photo and video sharing. What more could you ask for? You can take the Q3H action camera almost anywhere – thanks to the protective IP68 waterproof case, it can even be submerged in water for up to 30 metres and let you make amazing underwater recordings when snorkeling or diving. The camera offers great video quality with 4K at 25fps and bright clear pics at 16MP. The 170 degree wide angle lens will also let you make you footage and photos more expansive and immersive. The best part? You will be able to share your footage almost instantly by connecting the camera to Wi-Fi. The Q3Hsports camera comes with a wrist remote control that will let you trigger the cam remotely – a great option or those doing action sports. The cam also comes with a nice set of accessories: mounts, adhesives and more. The waterproof sports cam also features a mini HDMI port – so you will o have the option of viewing your recordings on the big screen. If you want to preview your footage right away, you can do that on the2 inch LCD display at the back of the cam.The action cam comes with a 900mAh battery – good for up to 1.5 hours usage time or 20 minutes recording 4K action. The 4K Q3H Waterproof Sports Camera comes with a 12 months warranty, brought to you by the leader in electronic devices as well as wholesale action cameras..